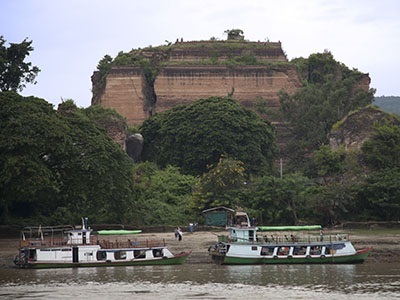 ABOARD KINDAT PANDAW-Somewhere north of Mandalay along the banks of the Ayeyarwady, we cast-off our moorings by 6:00 AM for the three-hour up-river cruise to Nwe Nyein, a village known for its pottery—in this case very large glazed pots. As we arrive we pass under a modern highway bridge and realize that this village is not as isolated as Yandabo. Once ashore we notice electric power lines, even a paved street. And the pottery making–while still family handicraft enterprises using riverbank clay–is more elaborate. It involves large brick kilns to fire the large pots and judging by the towering stacks of firewood, more energy and resources than Yandabo’s hay-stack firing. 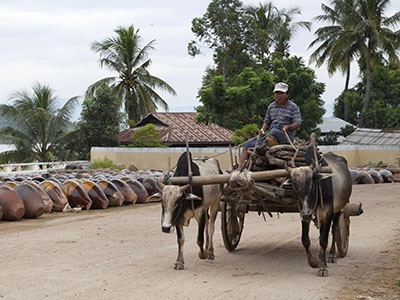 Oxcarts are usefully employed in the pottery business in Nwe Nyein. And quiet is elusive here with the frequent rattle and bang of a “Chinese Buffalo,” the local nickname for a strange little vehicle with a small, air-cooled, front-wheel drive, belt-driven powertrain. For the sake of the ambience, there are still a number of ox carts productively employed in the village. Our disembarkation briefing occurred during our downstream leg to Mingun. We were to vacate our cabins by 9:00 AM; breakfast would be served beginning at 6:00AM; settlement that evening with Bobo, our Purser, would result in return of our passports. Bobo also had specific information regarding ongoing transportation for all passengers, including time of pick-up. Now we’re beginning to realize how short our remaining time aboard will be. 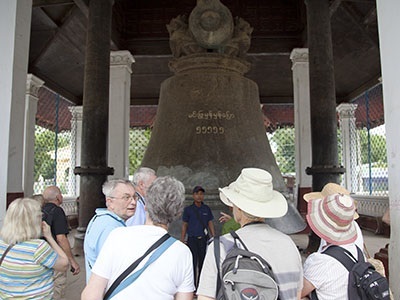 Kindat Pandaw passengers are impressed with the great bell of Mingun. Following lunch aboard, we moored at Mingun and continued our foot-powered excursions. The operative word for this, our last excursion, is colossal. Pahtodawgi, or Mingun Pagoda was begun in 1790 by King Bodawpaya with the intention of erecting the largest pagoda anywhere. Construction was halted due to a shortage of funds, but had it been completed, it would have exceeded the Great Pyramid of Giza in height. Even though the upper portion was toppled in an 1839 earthquake, the still-standing if seriously cracked base towers at 150 meters. We toured a couple of other sites here including the great bell of Mingun. The bronze behemoth weighs-in at 100 tons making it the world’s largest ringing bell, we are told. It too was ordered by King Bodawpaya, perhaps indicating a man obsessed with grandiosity. At least we got the chance to ring his bell. Running a gauntlet of street vendors and stalls was required for return to our vessel. 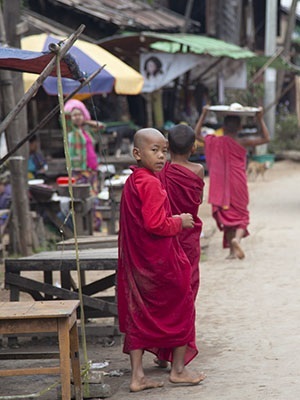 We returned at dusk to our previous moorage at Sagaing on the final leg of our cruise. We wound-up the evening with a farewell from all 21crew members, including some remarkably good singing. Then passengers said farewells to the crew–for whom we felt much respect and considerable affection—and to one another.